August is National Sandwich Month. Why not celebrate with some fun and delicious fundraising ideas! Here are a couple appealing thoughts to get your creative juices flowing and your tummies rumbling. Hold a “Sandwich Day” lunch or dinner event at a fun venue. Have a special day to bring supporters to a specific location for specialty sandwiches. It is a delicious way to support your organization or cause while enjoying a fun sandwich themed event with friends. Host a battle or showdown for the best sandwich event. Have celebrity chefs, community figures and or school faculty compete to “Create the Best Sandwich” or “slice it up in an epic sandwich battle”. Patrons will have fun sampling and voting on the great sandwiches for a worthwhile cause. You could even encourage bribes that will be donated to your cause. Hold an online photo contest for the best looking and or tasting sandwich. Have participants submit photos and recipes of their sandwiches. Establish how the sandwiches will be judged and by whom. Entries could be judged on appearance, appeal, simplicity/ease of making and originality. You can charge an entry fee for the submissions to be considered. Determine a fun prize for the winner and runners up that will encourage many participants e.g., cash prize, dinner party by a local chef or with a celebrity, restaurant certificates, cooking basket. You can also participate in established events like Foster Farms “Don't Call Me Basic” turkey sandwich contest to find the most inventive turkey sandwich recipe with a $4,000 cash award. 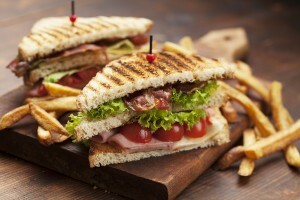 Create a cookbook of great sandwich recipes. Use photos & recipes from contest submissions as mentioned above. Create a few categories to encourage many levels and ages of participants. Participants love to be included in publications and if they are part of your school, church or community they will want to share the cookbook with family and friends. Have students and or faculty bring in their favorite sandwiches to be judged. The winners will get their sandwich featured at a future class lunch or added to the school menu. Another idea would be to have a change up to the usual school lunch. You could have two or three specialty sandwiches made by your group, staff, restaurants, or food truck vendors brought in and students and faculty would have the option to purchase and cast a vote on their favorite. Determine the best location for your event. Coordinate your event with a local restaurant. Many establishments would be thrilled to get some great media exposure and new diners to their restaurant. More details on holding a restaurant fundraiser. Hold event at your School or Church. Holding your event where your supporters already gather is a bonus for attendance. Consider holding event in conjunction with a festival, art show, community event. By taking advantage of an event already established you will benefit from the planning and marketing already in place. Consider a unique place like a park or a business that could offer nice opportunities and interest for your event. You could bring your sandwich showdown event to a larger business with several employees for a lunchtime change up. You may even want to look into working with a food truck or trucks that could travel to your venue. Use flyers, signs and local newspaper adverts to get the word out. Get your event details listed on your community calendar and posted on appropriate social media that can be shared by your supporter with friends. Make it easy for supporters to RSVP and or purchase tickets. There are several great online programs to help with reservations and payments. Have a sales contest for members that sell the most tickets. Make sure you sell tickets in advance as well as at the door to catch as many people as possible. Discounts can be offered to those buying early which will help with planning attendee count. This may be a perfect event to add additional revenue generators such as 50/50 raffle, Chinese raffle, heads or tails, auction items. No matter how you slice it, there are endless possibilities to have fun and raise money with sandwiches. Let your imagination and resourcefulness be your guide. Know that you can create an edible event around any kind of food that may work for your supporters. Almost every day is a National Food Holiday of some sort. Just add a little creativity and let the fundraising fun begin!